Oak Ridge High School Academic Decathletes Win Many Medals at State! Oak Ridge High School’s Academic Decathlon team claimed victory at this year’s El Dorado County Academic Decathlon competition in February and advanced to the state competition held in March. The team of nine students joined more than over 600 Decathletes from across the state in Sacramento for a fierce weekend of competition. They participated in all of the events that were held during El Dorado County’s Academic Decathlon including a full day of objective arena-style multiple choice exams, and second full day of speech, interview, and Super Quiz testing. Before arriving in Sacramento, students wrote their essays online at Oak Ridge. 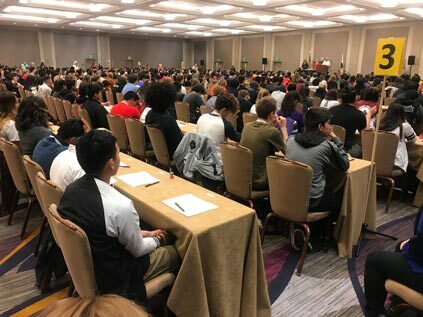 During the awards ceremony at the Sacramento Convention Center on Sunday, El Dorado County Decathletes took home 10 individual state medals! Congratulations to Oak Ridge High School Decathletes and Coach Jeff Hassian!